I've often wondered, while watching the various televised Eucharistic celebrations on EWTN (i.e. the Holy Sacrifice of the Mass, Eucharistic adoration, World Youth Day events, etc. ), whether or not there is any connection between the reality of Christ's Real Presence that is being recorded/broadcast live and the viewer(s) who are perceiving the live broadcast. Lets hypothetically say that I'm flipping through TV channels and I happen to land on EWTN precisely at the moment that Fr. Mitch Pacwa is elevating the consecrated Host during the liturgy of the Eucharist. As a Catholic, I'm obligated to believe that in that situation I would be looking at a real-time image of Jesus' body, blood, soul, and divinity present on the altar. Of course there should be some sort of reverence involved, but to what extent? I found it very interesting that during World Youth Day 2013 there were giant screens set up throughout the audience in order for everyone (3 million+) to be able to see the Eucharistic celebrations. 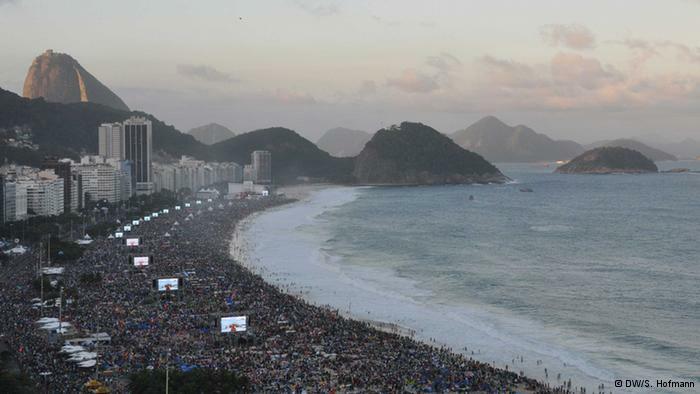 It seems apparent to me that Catholics were able to actively participate in the WYD 2013 Eucharistic events even though they might have been a mile or two down the beach. I'm wanting to know what the Catholic Church officially teaches about the metaphysical relationship between Christ's actual presence on the altar, and his "presence" on the receiving end of a live broadcast. Can someone who is home bound and is unable to attend Mass/adoration adore the Host as if they were truly present? To what extent are all Catholics obliged to revere the televised Host? It is important to understand that this question is exclusively about a live broadcast feed in real time, and not about any other type of Eucharistic image. This is specifically a Catholic question...so please no anti-Catholic "new age iconoclasm" please. So the standard is, "participate unless it is impossible", and "participate", as it is used in Canon Law, would necessitate actual attendance. Televised broadcasts would certainly fulfill the recommendation in 1248 §2, but that is clearly on a subservient level and can be readily exchanged for other forms of prayer. So the long and the short: the Eucharist, as a televised image, is worthy of reverence and it is a good thing to watch Mass when you can, but it is never necessary and nothing compares to the real thing.